Thiess Pty Ltd (Thiess) is the largest general contractor in Australia. It operates in a diverse range of disciplines, including mining, civil, building, process, rail, services, and tunneling. This issue picks up the Survey and Technology Applications Group in Thiess. Providing a head office function in Thiess, the Group demonstrates a high degree of specialization in spatial technologies and supports business unit operations within the company. Believing that it is important to capture and share information and knowledge, Thiess introduced Communities of Practice to facilitate it. Experts in specific areas are deployed to promote knowledge sharing as well as comprehensive implementation. Survey and Technology Applications is positioned as one of these fields. The group is comprised of experienced personnel who support business unit operations to ensure a consistent standard of survey practices, code of ethics, and quality systems. Full use is made of various IT (information technologies) including virtual construction modeling (3D / 4D and BIM (building information modeling)), geographical information systems (GIS), and laser scanning. Through such working environment and activities, the Group identified the advantages and possibilities of "UC-win/Road", a 3D real-time VR (virtual reality) software product offered by FORUM8. The software has already been used for a number of projects since it was introduced last year. We interviewed Mr. Andrew Miller, CAD Manager of Survey & Technology Applications, who has been focusing on the application of 3D/4D modeling to the construction process and is committed to research in this area. Thiess was founded as a road building contractor in the Darling Downs (in Queensland, Australia) in 1934. Since that time, Thiess has evolved into a leading mining, construction and services contractor with diverse operations in and out of Australia. In 1958, Thiess Brothers became the first Australian company to be awarded a major contract on the Snowy Mountains Hydro-Electric Scheme, being the largest contractor on the project. Since then, Thiess has played a pivotal role in Australia's construction industry, delivering essential infrastructure projects including highways and airports, dams, and ports. The needs of the post World War II period led the Company into a vital role in development of the nation's resource sector. Recognizing the potential of coal deposits in central Queensland, Thiess led their exploitation in the Bowen Basin. In 1972, Thiess entered the Indonesian market, establishing a foothold in the country through mining and construction services. In 1983, Thiess became part of Leighton Holdings Limited, Australia's largest project development and contracting group. Thiess has a workforce of 14,500 in total and this year celebrated its 75th anniversary. The Company delivers its services in cooperation with its subsidiaries, alliances and joint ventures (JV). One of the operating divisions that characterize Thiess is mining. While promoting the adoption of advanced mining techniques, Thiess has been developing and operating coal and metalifferous mine sites in Australia, Indonesia, and India. It is known as the largest supplier of outsourced mining services. Another big division is civil engineering. In conjunction with related divisions, Thiess delivers a diverse range of multi-disciplinary civil projects including roads and freeways, busways, rail, dams, mine and resource infrastructure, water infrastructure, pipelines, and power. Thiess Services, a wholly-owned subsidiary of Thiess, offers versatile and innovative environmental and utilities contracting services. Thiess has more than 20 years experience in providing integrated project solutions for complex process projects, covering areas such as minerals, oil and gas, pipelines, water and wastewater, and power. Thiess is also one of Australia's largest tunneling contractors. From the start of the Snowy Mountains Hydro-Electric Scheme, Thiess has undertaken work on more than 100 linear kilometers of tunnels over the past 50 years. In the rail division, Thiess delivers the highest standards of rail design, construction, operation and maintenance for various railway systems. 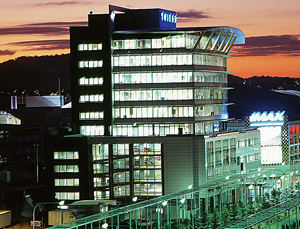 In 2008, Thiess implemented a major re-organization in order to offer clients improved services. In the building division, Thiess provides integrated design and construction solutions for both public and private sector building projects. Thiess is unique in having a head-office function such as that performed by the Survey and Technology Applications Group, explains Mr. Andrew Miller, a member of the group. The Survey and Technology Applications Group, located in the head office of Thiess, is engaged in the search for new technologies and knowledge in spatial technologies. It also supports the operational divisions of each state-based business unit, depending on the needs of the project. Assistance provided by the Group covers a range of areas including design proposals and tender submissions, project start-up and support, survey procedures, management and systems development, data processing and presentation, virtual construction modeling (3D / 4D / BIM), software and systems development, GIS, and laser scanning. Mr. Miller's primary responsibilities are for 3D/4D/virtual construction modeling. Originally qualifying as a mechanical engineer, some years ago Andrew discovered a passion for 3D and visual representation in the building field. He also expanded his fields of expertise to building engineering, civil engineering, and mining. At the same time, he continued his research on 4D modeling at the University of Queensland, sponsored by the company. He has recently submitted a doctoral thesis on innovation implementation in construction. 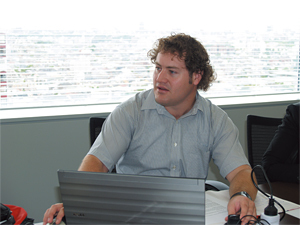 Andrew recalls that while he and other company staff continued their advanced use of various software tools, they were introduced to UC-win/Road by the manager of FORUM 8's Sydney Office. The group works with different partners depending on the project, and the tools used in each project are not always the same. In this sense, UC-win/Road had advantages in that it permitted the reduction of 3D modeling time, through its easy linking with different software tools. These advantages resulted in the installation of UC-win/Road at Thiess in the autumn of last year. After purchasing UC-win/Road, the Group first created 3D models of existing projects, with the twin goals of learning how to use the software as well as visualizing and demonstrating completed images of the project under construction to those concerned stakeholders. Secondly, they also used UC-win/Road to create before/after 3D visualizations in a submission for an Expression of Interest (EOI) for a new project. 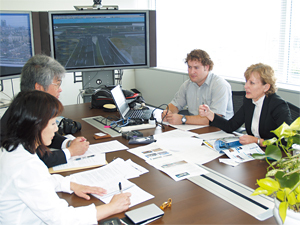 The specific project in the first case is "Airport Link". Airport Link is currently under construction in Brisbane, the state capital of Queensland, with the aim of improving access to the airport. 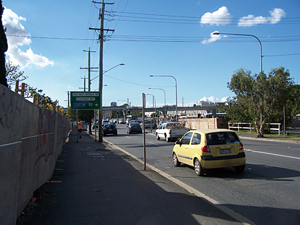 It is a 6.7km toll road, mainly underground, that connects the Clem 7 Tunnel, Inner City Bypass and local road network at Bowen Hills, to the nearby arterials. Airport Link is a part of Australia's largest-ever road infrastructure project, along with the Northern Busway (the Windsor to Kedron section) and Airport Roundabout Upgrade with the 750-meter flyover, and design to eliminate traffic bottlenecks. It is scheduled for completion in 2012. For this project, the State of Queensland awarded BrisConnections the contract to design, construct, operate, maintain and finance Airport Link for a period of 45 years. 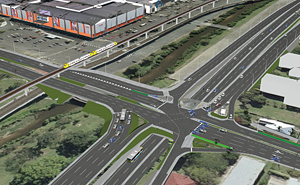 BrisConnections will also design and construct the Northern Busway (Windsor to Kedron) and Airport Roundabout Upgrade Projects. Thiess, as one of the sponsors of BrisConnections, organized a JV with John Holland Group (Thiess John Holland) to take charge of the design, construction and commissioning of these projects. A JV between Thiess Services Pty Ltd and John Holland Services Pty Ltd will assume the operation, maintenance and repair of Airport Link. 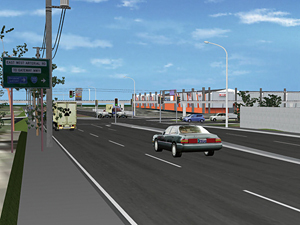 After Thiess began construction of the project in mid 2008, in October the Survey and Technology Applications Group started 3D modeling using UC-win/Road. 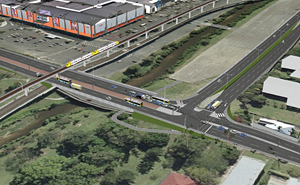 With their first use of UC-win/Road in an actual project, it took them nearly two months to create a series of 3D models for Airport Link. Mr. Miller agrees that they achieved their goal of building models within as short time as possible. 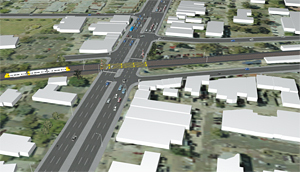 For the second case of EOI, the Group worked on a proposal for a railroad-crossing project (with an underground railroad track) in a suburb of Melbourne in spring of 2009. It took them less than 30 hours to create 3D models for the EOI using UC-win/Road, partly because they utilized existing terrain and alignment data as well as architectural models. They also created a 4D model visualizing the changing construction process over time, by linking UC-win/Road to an existing tool. Combining 3D and 4D modeling tools will result in easy and effective proposal creation, Andrew says. Mr. Andrew Miller says that he is keen to promote the recognition of 3D / 4D modeling within the company so that 3D VR and 4D models can be created and utilized from the early stages of a project. In particular, he believes that VR has great potential as a communication tool. He anticipates the improved efficiency of the Thiess modeling process and looks forward to working with FORUM8 to continuously strengthen the UC-win/Road functions.